Dave and Stan. Or Batman and Robin. 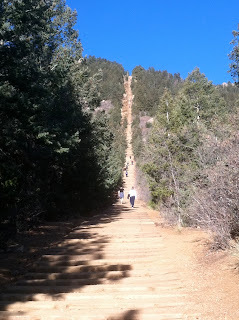 So there's this little thing called "The Incline" in Manitou Springs, CO and folks in those parts eat it for breakfast. See that first photo? 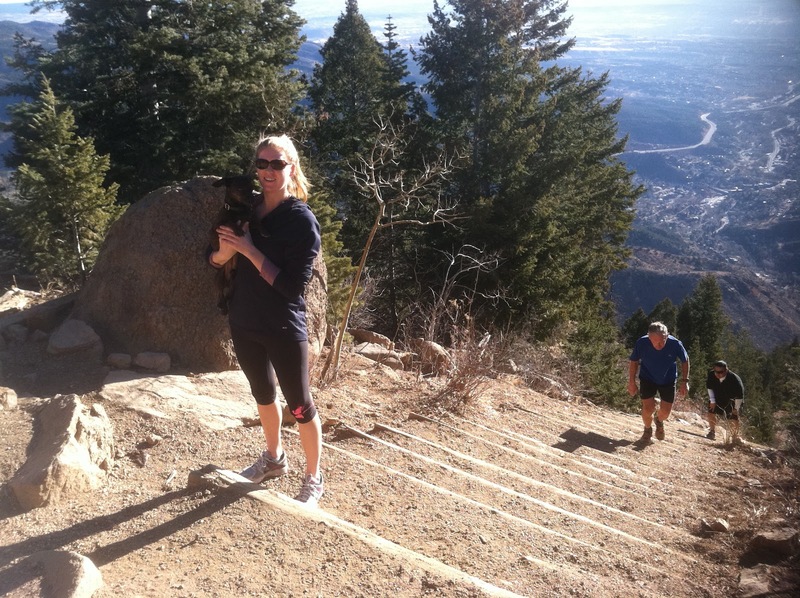 That's my brother-in-law, Dave Philipps, ultra runner, journalist and author of Lethal Warriors (that's a blog post to write in the future, but in the meantime google it; it changed my world) at The Incline's base with sidekick Stanley. The Incline is a mile-long, 1900 foot elevation gain ascent up the base of Pikes Peak originally built to carry materials via cable car to build pipelines on Pikes Peak. After the pipes were built, they used it to get tourists up to the top for the splendid view. After a damaging rock slide, the attraction was shut down, but foot travelers took this as an opportunity to get in a really good workout. If you didn't already gather from its name, it is a rigorous, anaerobic, very steep hike to the top at high altitude with low oxygen levels. The closer one gets to victory, the steeper and wider the steps become. For my Vermont peeps, it's kind of like hiking the last 1/4 mile of Camel's Hump from the Waterbury side 4 times while plugging your nose. This is a challenge I like to torture myself with every time I visit my sister and her family in Colorado. My first attempt in 2006 failed shamefully when I used the halfway bailout path. At the time, I couldn't fathom one more upward step. And I didn't believe that I was capable of making it to the top. 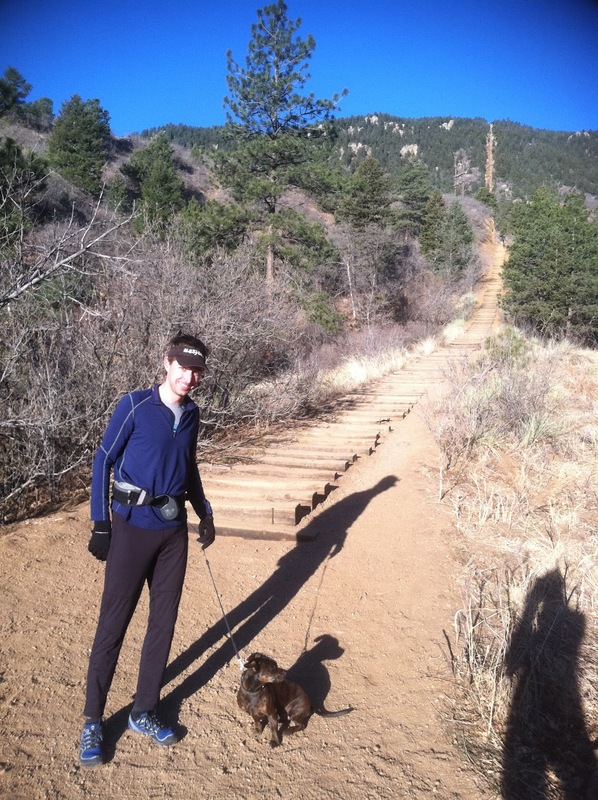 My mind was plagued with a list of excuses: I am not used to the elevation, I didn't have my Wheaties today, I'm not in good enough shape, I'm not a crazy Coloradan. So I took the easy way out and bailed. I waited a few years before trying it again in the beginning of 2010, this time determined and equipped with the full belief that I was perfectly capable and prepared to make it to the top. Precious moments were shared along the way with training Russian Olympians, a whole beefy lot of them resting near the halfway mark, wooting me cheerfully as I passed by them. Dave went ahead of me and timed my journey from the top, 41 minutes to the very last step. The reward is a sweet view of the nested city below and endless volumes of the bluest sky. These photos are from my 5th and most recent ascent, just a couple of weeks ago while visiting CO. Dave woke me at 6 am on Saturday, also something I didn't used to think I could do, but now relish the beauty of early mornings when they actually happen for me (not too often). We soaked up some caffeine and flew out to Manitou Springs where parking was already sparse with early morning flocks of incliners. Dave pushed ahead with his ultra runner lungs and legs as I tried to slip into a Pandora-infused trance at a smooth, careful pace. I paused my journey to let two teenage boys, both with headphones and heavy sweats, pass by me so I could capitalize on some personal space. I couldn't help but think how awfully cute it was to see the two of them climbing this giant hill together on an early Saturday morning. It's wasn't too long before I passed by them while they were taking a break on the sidelines to catch their breath, bent over at the waist, peeling layers of sweat material off already-exhausted limbs. I gave them silent high fives. "...I think I remember those eyes, eyes, eyes. Cause baby tonight, the dj got us fallin in love again..." YES! I love this song! I propelled upward happier with Usher and Pitbull cheering me on, making it to the destination in 40 flat minutes. And this is the lovely view at the top (photo below), little Colorado Springs nested below and endless volumes of the bluest sky. From the top, the rails drop off like the tracks of a roller coaster at its steepest and highest peek. Along the route, I took inventory of my compadres. They included men, women, young, old, fast, slow, thick and thin. All kinds are permitted here. To google "the incline" is to discover an incline club of sorts. 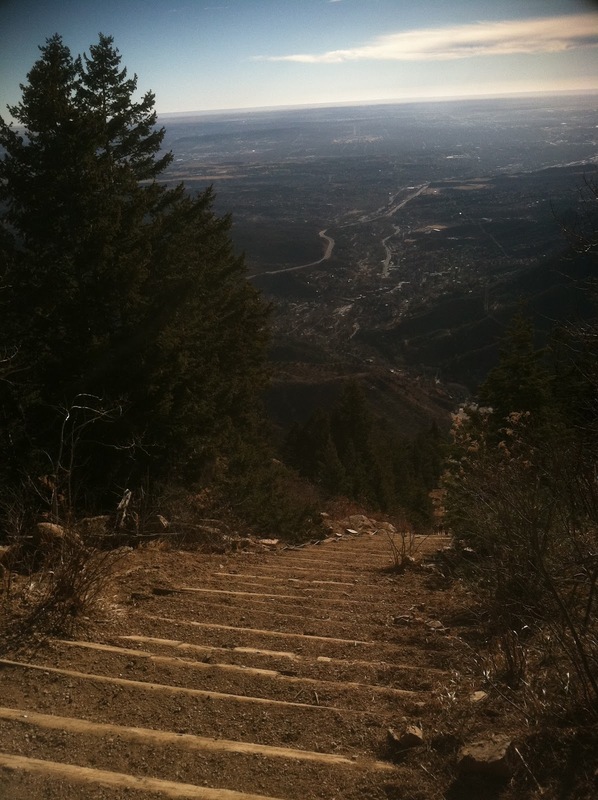 There is a comradeship and joy in being a successful incline hiker. There are forums to post times (the best times seem to be in the 20 minute category) and comments on one's experience. For me, this challenge is about doing. It's not just about trying, because in trying we sometimes already acknowledge the possibility of failure. I believe that in order to conquer the variety of challenges set before us in life, from wee-est to grandest, we must calm our inner critic, the voice that says we can't do things and makes lists of very creative excuses for us why not, and just do. As a creative person I constantly have to check my inner critic at the door, allowing the freedom to just paint. Of course there is a plethora of daily doubts on my mind, and I am careful to weed doubt from reality, b doubt kills dreams and makes unhappy people. And we need happy people here. I encourage you to quiet your inner critic and move forward with the audacity that we are all capable of. Just be. Just do. Nike says it well, "Just do it." Stop over thinking it. Even the tiniest challenges show us what we're capable of. Be well. Be proud. Just be.